A collision between coast guard vessels from the two countries indicates a minor escalation. The stand-off between China and Vietnam over the former’s decision to place an oil rig in disputed waters in the South China Sea escalated on Tuesday when a Chinese coast guard ship rammed a Vietnamese coast guard ship. The Vietnamese vessel allegedly suffered several “gashes” in its metal hull according to the Wall Street Journal. No Vietnamese sailors were injured and the boat did not sink. The incident reflects a sort of escalation in the dispute. While a Chinese vessel rammed and sank a Vietnamese civilian vessel (a fishing boat) last month, Tuesday’s incident is a case of two coast guard ships from the two countries becoming involved in a physical altercation. 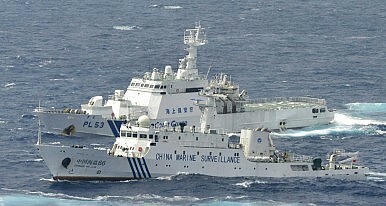 In another incident, a Chinese vessel fired a water cannon at a Vietnamese ocean inspection ship. No naval assets from either side were involved in either exchange. So far, neither Vietnamese nor Chinese officials have commented on the incident. The initial report comes courtesy of a Vietnamese TV news station VTV1. According to the WSJ, “TV footage appeared to show a Chinese law-enforcement ship pursuing the Vietnamese vessel and dousing it with a water hose, before crashing into its right side.” The latest statement by Chinese foreign ministry spokesman Hong Lei on the issue places the blame on Hanoi. “China has been asking Vietnam all along to stop its interference with the drilling activities,” he said. “Vietnam continues to conduct ramming activities. Vietnam is creating tension and violating international law.” China maintains that it is operating the oil rig in waters that fall under its sovereignty under its nine-dash line claim to the South China Sea; consistent with that claim, it alleges that Vietnam is the aggressor. A statement from the Vietnamese government will likely be forthcoming on the ramming. When a Chinese ship sank a Vietnamese fishing boat on May 26, Vietnam condemned China for what it called an “inhuman action.” This latest incident suggests that China remains content to use moderate kinetic force against Vietnamese civilian and coast guard vessels. While this can be considered a sort of escalation, the conflict has not yet reached the point where either country feels comfortable using naval assets. China has several PLA Navy ships in the vicinity of the oil rig as it explores the waters in Vietnam’s Exclusive Economic Zone (EEZ). Vietnam, for its part, has a relatively robust navy including Russian Kilo-class submarines. The incident comes shortly after the Shangri-La Dialogue in Singapore which took place last weekend amid tensions in the South China Sea. As The Diplomat reported earlier, China’s placement of the giant state-owned HD-981 oil rig inside Vietnam’s EEZ was an unprecedented and unexpected move that has deeply destabilized bilateral relations between China and Vietnam. While Vietnam’s government has practiced relative restraint when it comes to the use of military force, severe anti-China protests have taken over the country and Vietnamese officials are planning on handling the dispute through international legal means. China had good strategic reasons for placing an oil rig off the coast of Vietnam in the South China Sea.